Tropical Storm Bret will continue to spread heavy rain and gusty winds across the southern Windward Islands and northeastern Venezuela through Tuesday. Tropical Storm Bret is currently about 75 miles east-southeast of Isla Margarita, moving swiftly toward the west-northwest. Bret is expected to move near or along the northeast coast of Venezuela Tuesday and into the extreme southeastern Caribbean Sea by late Tuesday. 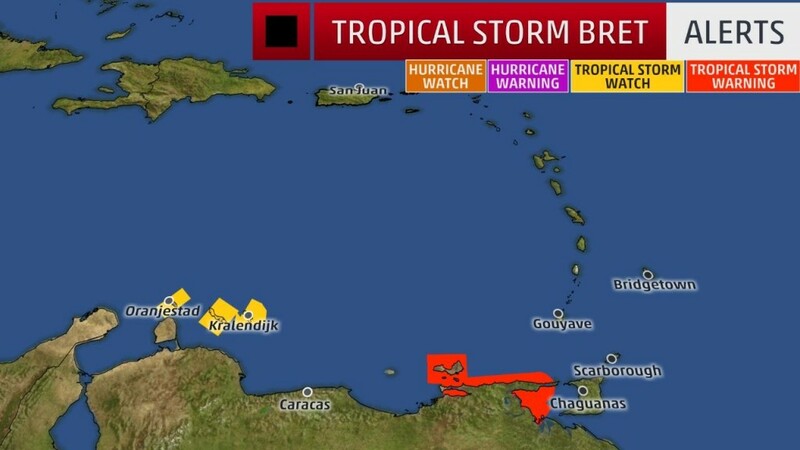 Tropical storm warnings are in effect for portions of the northeastern coast of Venezuela. Heavy rain, gusty winds and increased seas are expected to be the main threats in these areas into Tuesday. Little change in strength is expected during the next 12 to 24 hours. After passing through the Windward Islands, the forecast calls for this system to weaken into a tropical depression on Wednesday, due to increasing south-southwesterly wind shear and land interaction with Venezuela. On Monday, there were reports of damaged roofs on the islands of Trinidad, Tobago and Grenada. Tropical storm conditions, including gusty winds and heavy rain, will begin to subside later Tuesday in portions of the southern Windward Islands and the northeastern coast of Venezuela. Total rainfall accumulations of 2 to 4 inches are currently expected over the Windward Islands and the northeastern coast of Venezuela through Tuesday. Tropical storm warnings remain in effect for portions of Venezuela from Pedernales to Cumana, including Isla de Margarita. A tropical storm watch is in effect for Aruba, Bonaire and Curaçao.